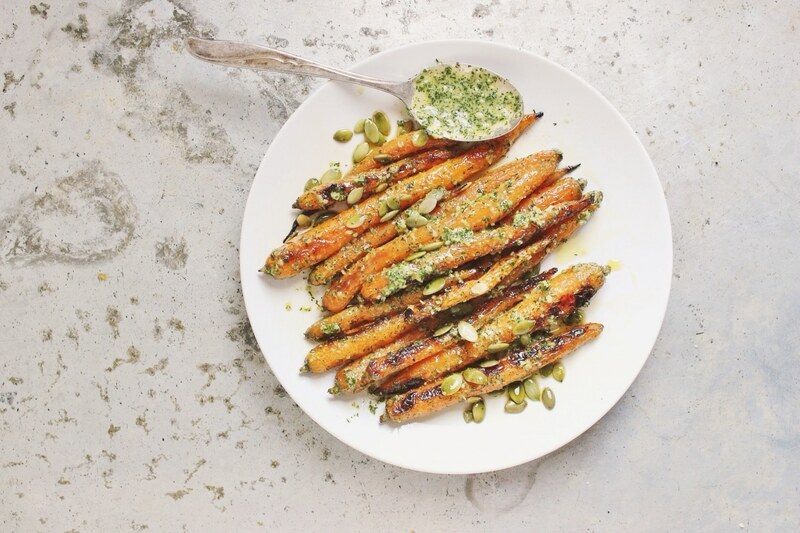 Roasted spring carrots smothered with a vegan lemon, dill pesto - so easy to make and so packed with flavor. Except when pickles are involved, I’ve never really been a fan of dill. It wasn’t really an herb my mother cooked with a lot growing up in my Italian American home. So it wasn’t really something I was inclined to experiment with. But I’ve been love it a lot lately and now, I’m totally obsessed it. Do you know how good this stuff is? I can’t believe I’ve been missing out on this for the past 30 something years. I mean seriously. 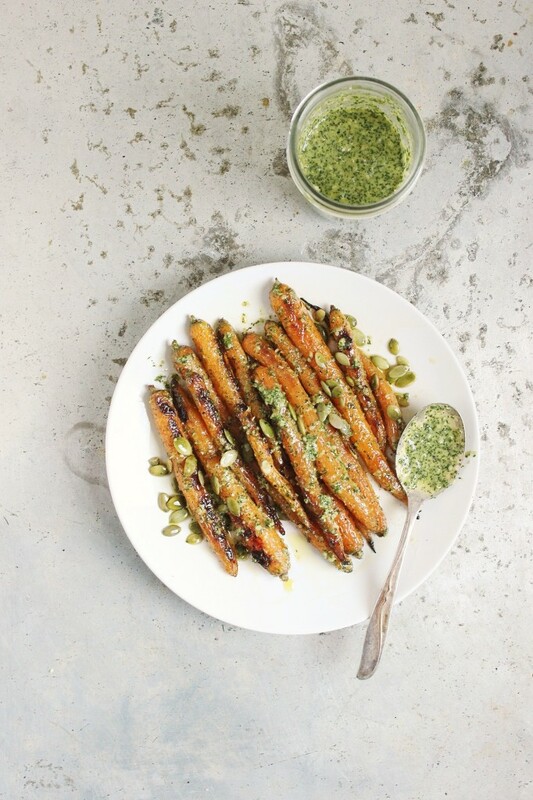 We all love roasted carrots, but this Lemony Dill Pesto really puts them over the edge. 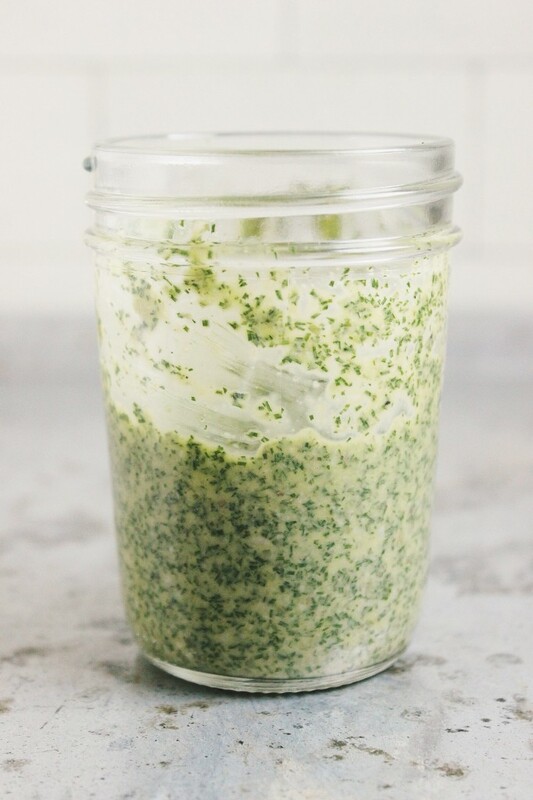 This dairy + nut free pesto is seriously addictive. So make it and eat it at your own risk, consider yourself warned. There will plenty of leftover yummies, so you can put it on anything practically. Top it upon these roasted carrots, roasted vegetables of all kinds, salad greens, quinoa, rice, pasta; I mean the list could go on for days. Takes under 30 minutes to cook + serves 2 people as a main and 4 people as a side. Preheat the oven to 400 degrees. Scrub your carrots, trim the ends, the tops and pat dry. If your carrots are teeny baby ones like mine, keep them whole. If they’re larger, halve them. Place the carrots on a baking sheet or oven safe roasting dish. Drizzle the ghee or oil over them, sprinkle with a pinch of sea salt and pepper and toss, to coat evenly. Roast for 25 – 30 minutes, flipping half way through. Combine all the ingredients in a food processor. Pulse until a smooth, yet slightly chunky pesto forms. Drizzle on top of the carrots or eat it out of the jar with a spoon, whatevs. This is so gorgeous! I’m with you on dill — I don’t even know if I knew what it tasted like until sometime last summer! But now I’m HOOKED. 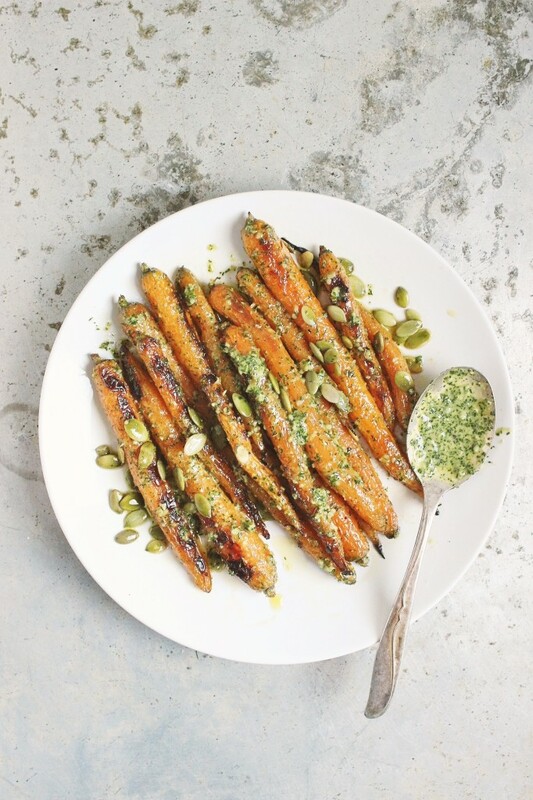 I love roasted carrots with a passion and dill even more, so I can only imagine how delicious this is. It’s going to have to make an appearance on my table ASAP. And beautiful, beautiful photos, Sherrie. Thanks for this recipe. It’s such a wonderful way to use dill. I reduced the olive oil to 2 tbsps and added 1/2 an avacado. I ate this with gnocchi and today we’re going to eat it in a roasted potato salad! Yum!